Meet our Sew to Serve spotlight, Crafting Forward! 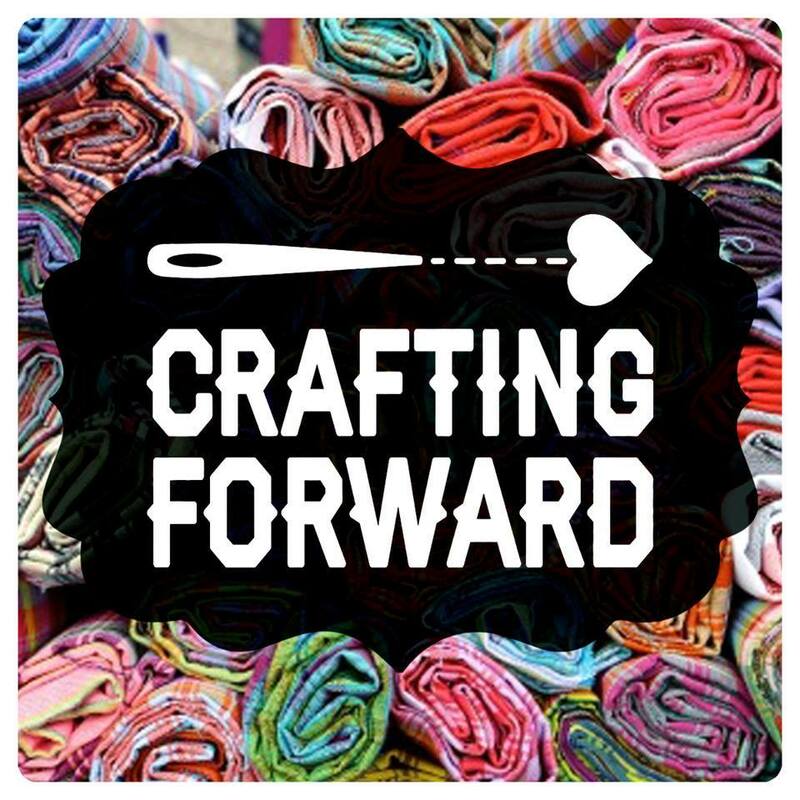 Kari Cadenhead from Tucson, AZ along with friend Aimee Cronenberg has founded a new non-profit called Crafting Forward, dedicated to serving others through sewing. I’ve been sewing a long time, and tend to take my sewing skills for granted – I have a big sewing room filled with fabrics, threads, patterns, sewing machines, (did I mention fabrics? ), and so I can create almost anything I need or can imagine. There are many people who would love to be able to sew and have the same opportunities to create, but don’t know how to begin and can’t afford to buy all the needed tools and materials to get started. Being able to sew is a powerful skill; it can provide the ability to mend, custom fit, or make your own garments, make needed items for your home, create gifts for others, and even contribute income through selling handmade goods. A student sews a dress at Crafting Forward. At the moment Kari reports that generous donations have left their sorting area and storage room bursting at the seams! 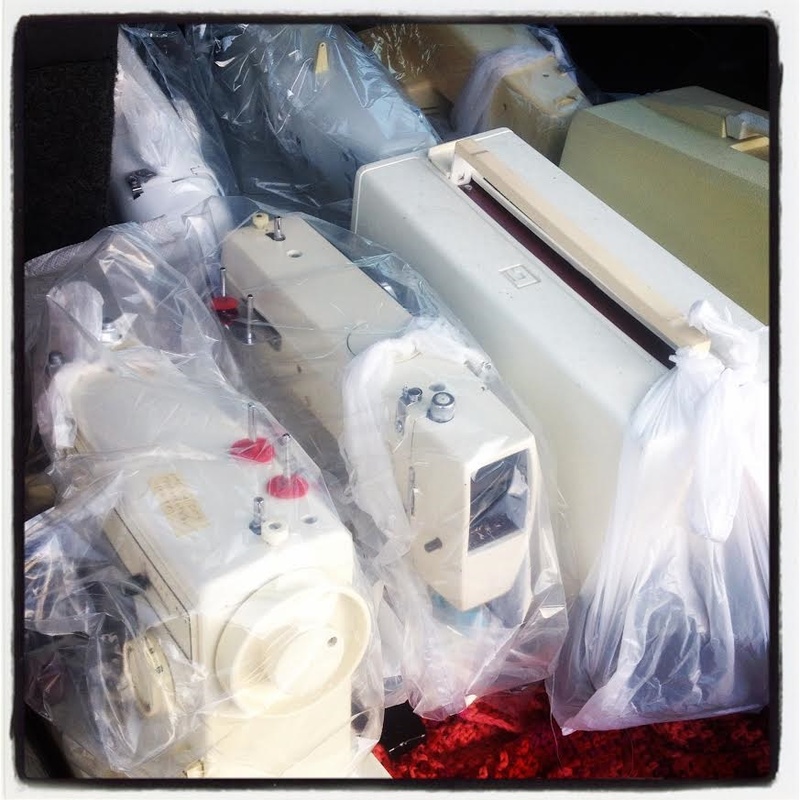 Check out all of these sewing machines donated to help others learn to sew. That’s a whole lot of sewing potential! Although the steady stream of donations is greatly appreciated, Kari is currently in the process of seeking volunteers who can help take the sewing and crafting out of the classroom and in to student’s homes that may not be able to travel easily for classes. If you are in the Tucson area and would like to help, get in touch with Crafting Forward to help. 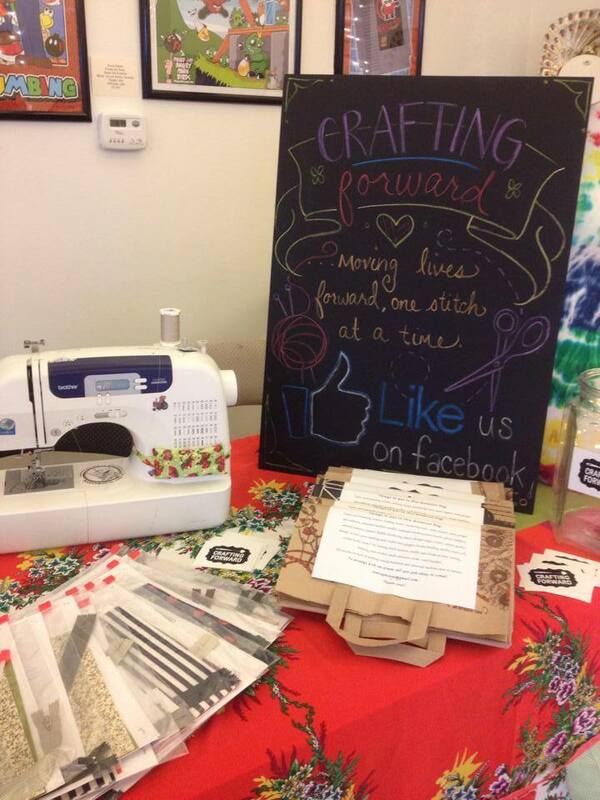 Find the official Crafting Forward Fan Page at Facebook, where you can learn about upcoming events and fundraisers. You can also visit the Crafting Forward funding page here, where the organization raises funds to further their mission. Keep up with what’s new to Crafting Forward at the official blog. And, to contact the organization directly and find out about volunteering or donation supplies, reach Crafting Forward at sewingmouse@gmail.com. Erika: Just like you, I learned to sew from my mom. Do you remember what the very first sewing project was that you made with your mom? And what are you teaching your son to sew? Kari: My first sewing projects – with my grandma it was a baby doll dress (she still has it!) done by hand stitching, and a sewing machine cover with my mom, using her machine. I think I was 6 and 7/8 respectively. 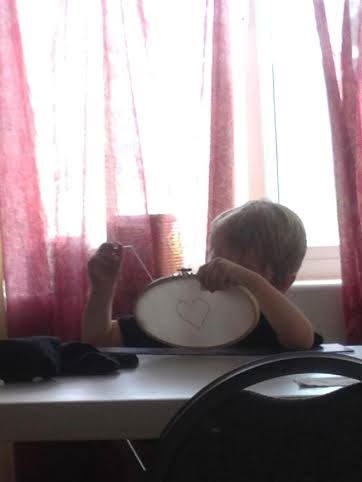 My son has sewn a little heart onto some fabric, and a sun. I picked small simple things to draw on some fabric and he picks it up when he feels like it to do a few stitches here and there. Erika: Why do you think that sewing, crafting or making is such an important skill to learn, and how has being able to make things yourself affected your life? 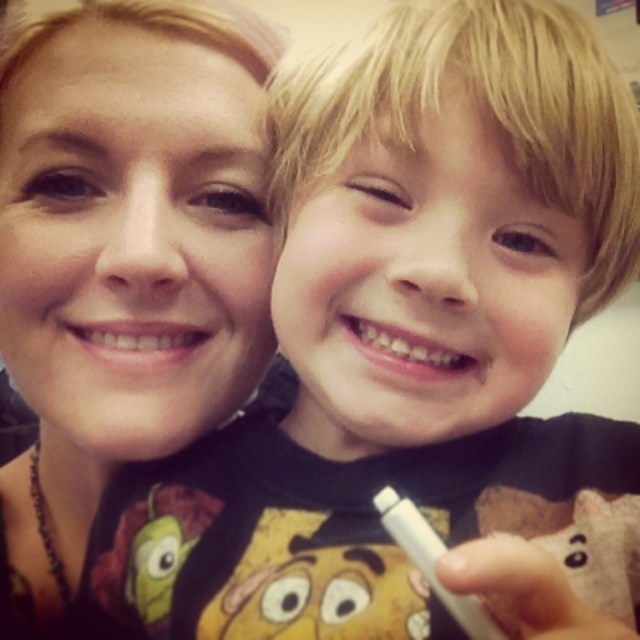 Kari: My reasons for doing and teaching anything craft related are threefold. One, it saves money and allows us to recycle all the fibers that are out there. Two, it’s so incredibly therapeutic! Having an outlet to be productive with your hands can really help your mental state. It calms and relaxes and gives you something to focus on that brings about a rewarding end product. Three, I think it is really important to keep perpetuating crafting to hold together past and present generations. It’s like storytelling, but through fabric and yarn. For me, all of these reasons have come into play in my life at some point or another. I learned from three different generations how to sew and embroider. I learned to recycle from my Depression-era great-grandmother, which started when I was very young and has lent a theme of eco-conscienceness to the rest of my life. I’ve used a lot of fabric given to me from my grandmother, each piece with a story attached… so my son, born in 2009, has a baby bonnet made from fabric that was purchased in the 1950’s to make my father and grandfather shirts. Pieces of my family history are all around me, even my bedroom curtains are made from yards of yellow taffeta that my great-grandmother left when she passed away. We are a military family and those little reminders are very important to me and help me to feel closer to the women who have brought me up but who are now gone or live so far away. I’ve also struggled with depression much of my life and making things has kept me feeling useful. I understand how it feels to be kind of wandering and lost, but the minute I start sewing everything comes into sharp focus and for the moment I am simply doing. Erika: How did you and Aimee Cronenberg find the idea to help others in your community through sewing and crafting? 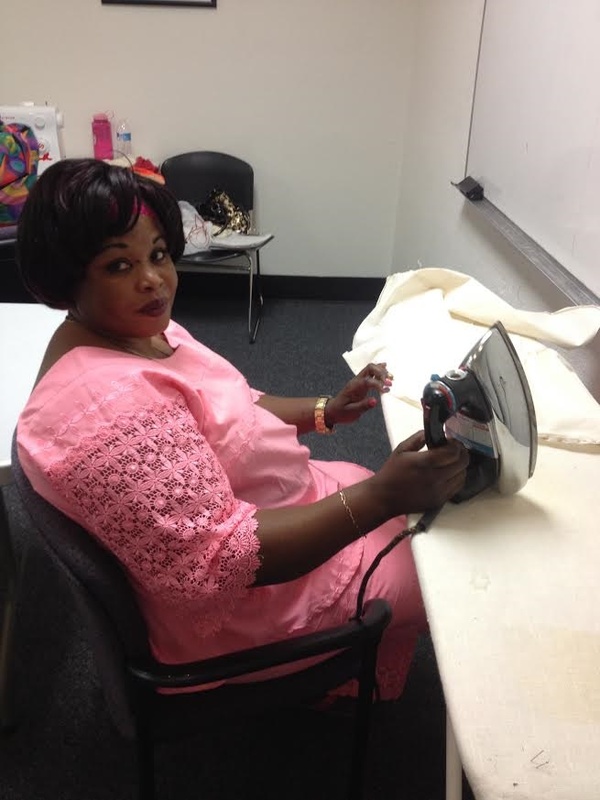 Erika: How has learning new sewing skills, or even receiving a donation of a sewing machine through Crafting Forward positively affected people in your community? A woman called me today asking questions about what we provide. She was in a car accident ten years ago and has had multiple brain injuries since then. She said she was all ready to open a handmade boutique right before her accident and then lost everything. She had so much difficulty sewing after that that she gave away all of her supplies. She would really like to re-learn how to sew now, but she can’t work at all and is on disability and doesn’t have the money to pay for lessons or supplies, and her machine is broken and unfixable. I was able to tell her that we will be able to provide her with a machine and all the startup supplies, plus some fabric, and come to her to give her some one-on-one lessons since she is unable to drive. She may not ever be able to make enough to sell, as she had planned many years ago, but the thought of having an outlet again to do something with her hands had her almost in tears on the phone today. It makes me really thankful that I’ve gotten so much community support so far, so as to be able to provide that to her and to the refugee girls. I hope to be able to reach many of the communities here in Tucson in the future. Erika: If someone wanted to volunteer to teach others to sew in their own communities but didn’t know how to get started, what advice would you give to them? Kari: If you have a skill and want to pass it on, start honing your teaching skills on your friends! Become confident in your ability to share what you know – you don’t have to be a professional to teach a beginner, watch youtube videos to learn the best way to communicate information. Ask for help gathering donations of books and supplies; I started asking on Craigslist and Facebook. Discuss a partnership with a local fabric, sewing, or yarn store. Local businesses generally really like to give back to the community and may provide a discount to fix machines or a space to hold classes, and some have newsletters that they may be willing to advertise in. Haunt coffee shops and post fliers explaining what you are trying to accomplish – crafters love coffee shops. Talk to church and social service communities to find people who are wanting to learn, even the girl scouts! We are currently in discussion with a rehabilitation clinic in the area, and I’m hoping to reach out to homeless and women’s shelters as well. Start small, but don’t be afraid to jump in with both feet! The need is there, people are just not accustomed to asking for this sort of thing. Talk about it ALL the time, to anyone who will listen. That has been the hardest and most rewarding part for me, and it has generated a lot of support.